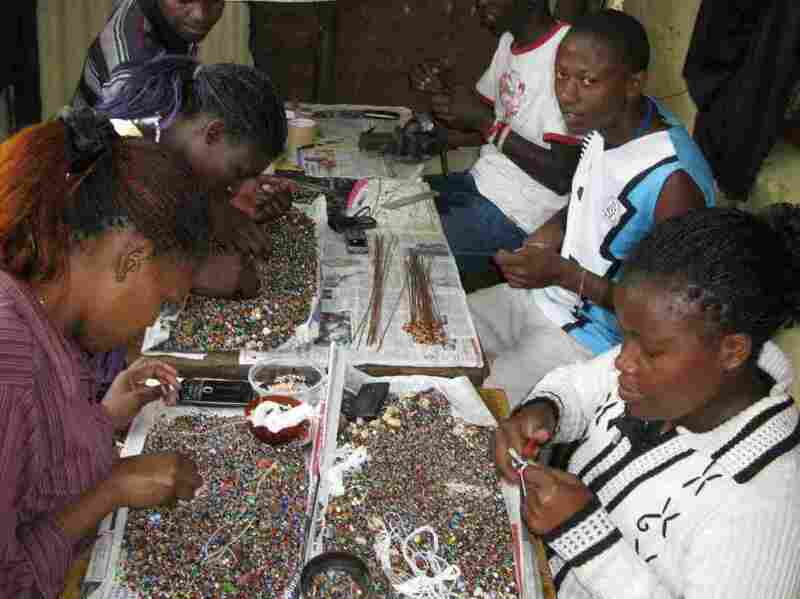 From A Life Of Crime To Designing Jewelry, All In A Nairobi Slum : The Two-Way Zakale Creations is a jewelry-designing operation that employs 30 young people — former thieves and prostitutes. The Nairobi-based operation is the brainchild of John Mucheru, himself a former mugger. Zakale Creations is a jewelry-designing operation that employs 30 young people who were previously involved in crime. The Nairobi-based operation is the brainchild of John Mucheru, himself a former mugger. After covering East Africa for five months, a profound problem I encountered in every country was what will happen to the continent's exploding cities. The U.N. predicts that by 2040, six in 10 Africans will live in cities — an estimated 1 billion people. One of the pressing questions for African leaders is how to occupy all the idle young men who turn to crime because there are no jobs. In Nairobi's Huruma slum, I came across a point of light — one man's attempt to take in thieves and prostitutes and give them honest work, of all things, making jewelry. John Mucheru is himself a product of Huruma. As a skilled teenaged mugger, he was headed to an early grave when his artistic talent was spotted and he was offered a job designing jewelry. That eventually led to Zakale Creations, where the 41-year-old Mucheru today employs 30 young people who would otherwise be contributing to Nairobi's crime rate. 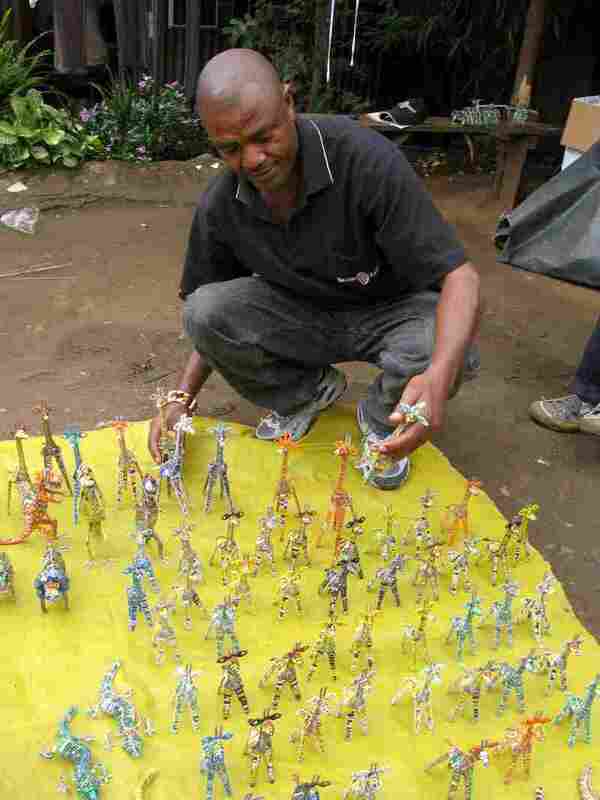 John Mucheru of Zakale Creations poses with his jewelry designs in Nairobi's Huruma slum. They work in a ramshackle workshop at the end of a compound bordered by gritty tenements hung with laundry and scavenged by chickens. The young people sit at long tables all day listening to a radio and turning recycled items into art: bottle tops, copper wire, cords from tires, soda straws, aluminum pots, seeds, bones and buttons. They make toy animals, bead necklaces and earrings. "We are also recycling people," Mucheru says. "Hookers and robbers gain a new life they never expected." Milton Obote began thieving when he was orphaned at 9. He stole dictionaries and Bibles from his primary school. He graduated to holdups. With handmade toy pistols called mbonos — "at night they look real," he remembers — Obote and his gang would board public buses and rob passengers of watches, money and mobile phones. When he wasn't stealing, Obote played soccer in a youth league run by Mucheru. One day the older man urged him to make jewelry. Now Obote is a production manager at Zakale, which means "to use again." "There are no jobs for young people in Nairobi. That's why they turn to crime," he says. "Most of them come from my situation — they were gangsters and drug addicts." Of the 10 young men Obote started with at Zakale Creations, eight are dead — most shot by police. Even today, some of the young employees are frustrated with the pay of $18 a week. "Some of them don't like sitting and working here, so they go back to the streets," Obote says. "They die and they're buried." Ruth Ngendo, a pretty 21-year-old with heavy-lidded eyes, says in the Huruma slum it is not uncommon for girls to turn to prostitution as young as 13 — as she did. "You sell yourself, buy some food for your family," she says without emotion. "The girls get pregnant and abort. You find dead fetuses in paper bags in the street." "This job keeps me away from stealing, from being idle," Ngendo continues. "I get up in the morning, I prepare myself, I come here. I'm not corrupted. I can put a plate on my family's table. And I enjoy beadwork." Zakale Creations survives on the slimmest of margins. The work that keeps these young people off the streets of Nairobi depends on orders from overseas. The Christian humanitarian organization World Vision sells Mucheru's jewelry under the Heavenly Treasures brand in its Christmas catalog. Making jewelry is not necessarily an answer to the larger problem of unemployed youth in Africa's sprawling urban slums, but it is, at the moment, a lifeline for 30 Nairobi youths with few options.